The lean Camaro featured a classic long hood, short deck profile and became the Indianapolis 500 Pace Car in 1967 and 1969, so A.J. Foyt and Mario Andretti each won one. Power ruled the ‘60s and Camaro was happy to play the power game with its 300-horsepower 350 cu.in.V8. The name has endured too and today’s Camaro keeps bits of the original’s styling, while being thoroughly up to date mechanically. No denying the new ones run better and ride a lot better. But the 1960s Camaros set the tone for what was to follow. Auto World delivers a high-value version of Chevy’s racy SS model with a white swoosh (before swooshes were popular, or trademarked) up the front fender and back to the door handle. There’s also a decal that touts the 350 engine with that number within the white stripe. The orange paint scheme is eye-catching and well executed for the price point. Windows are trimmed in silver paint to set them off from the body, as are the door handles and black and silver vents behind the doors. There’s a silver strip along the rocker panels too. Badging is good with a Camaro SS logo on the front quarter panel just in front of the door, plus Camaro badging on both the nose and tail. 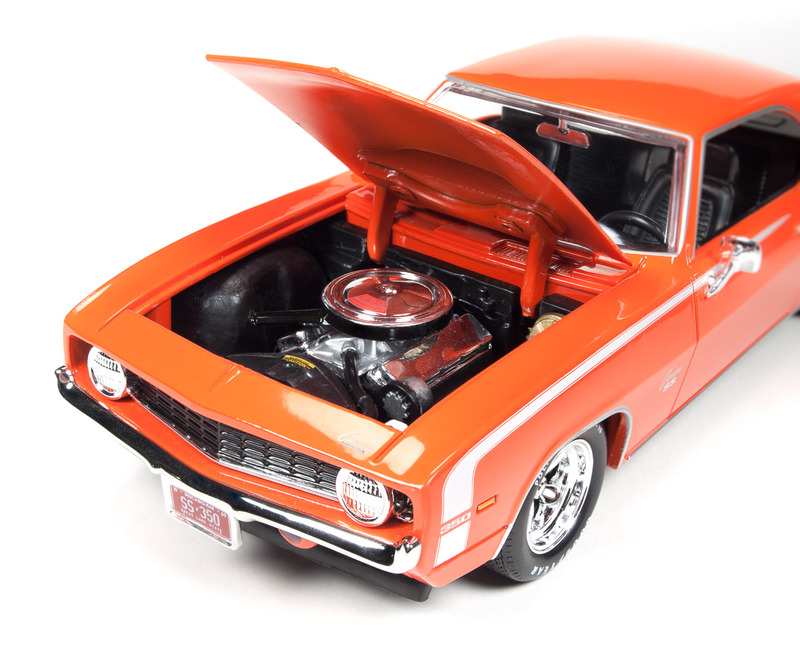 The 1/24 model’s hood opens to reveal a customized version of the Chevy V8. There’s an orange engine block and Auto World adds chrome headers and a giant round chrome air filter. There’s also a battery, radiator and belt pulley. Plus the hood stays open easily due to its huge metal hinges. This model features a Shaker hood with its trademark big power bulge and the SS also comes with blacked out front grille. Headlights are chrome, not clear lenses. A sporty looking chrome mirror sits atop the driver’s door and the car sports a black chin spoiler. Down low there are racy looking chrome sport wheels that appear to be Cragers and Auto World adds realism with treaded tires that are labeled Goodyear, plus they are detailed with Polyglas GT G60-15 labeling too. Since doors and trunk don’t open, the seams are straight and narrow, better even than on the original cars of the 1960s where fit and finish often were lacking. A red Michigan license plate graces the front and rear too. Inside is a black plastic interior with high-backed race-oriented bucket seats. The only real color is the snazzy silver shift knob and rearview mirror. Under the car is a moderately detailed chassis and suspension system, plus the underside of the orange engine block. 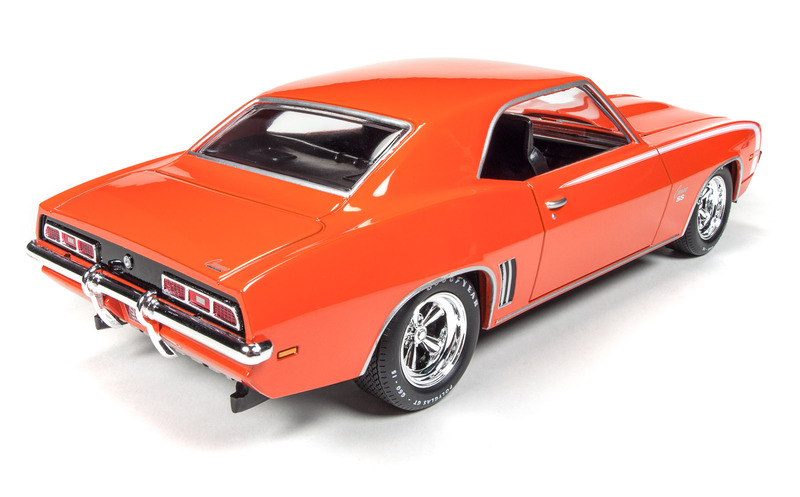 Overall the 1/24 Camaro looks sharp and is attractively priced for collectors of all ages. Its aggressive stance and that eye-popping orange finish make it a grabber in any showcase.